Hello friends, and welcome to another episode of PianoTV. Today we’re back with another analysis for casual music fans: an analysis of Canon in D, the ever-famous wedding song. We’re going to talk about the history of the piece, listen through some of the song and talk about theory. It won’t be anything too heavy and theory-intense, though, so even if your understanding of music is rudimentary, you should still be able to make sense of this. If you missed the first analysis video of Clair de Lune, definitely check it out – it was a ton of fun to make! Also, I recently wrote a beginner-ish tutorial for Canon in D with a PDF of the sheet music, so you can check out that video if you’re interested. Before we get into the backstory and analysis, I just wanted to share a couple versions of Canon in D for you to listen to – a traditional orchestral version, and an arranged piano version. So I want to touch on a couple tidbits we talked about in the Canon in D piano tutorial video – namely, the backstory basics. Canon in D was written by Johann Pachelbel, who was a German composer in the Baroque period (Think late 17th century). It was originally written for 3 violins and a basso continuo. In the Baroque period, the basso continuo was a “continuous bass” usually played by a couple instruments – first, a cello, double bass or some other low-sounding instrument, paired with an instrument capable of chords, like keyboards and lutes. Think of the basso continuo as the background part. And in this song, the three violins would be the main tune/melody. Analysis of Canon in D: What’s in a name? So let’s decode the name. If any song says “___ in D”, it’s telling you what key it’s in. So this song is in the key of D major. Usually if it’s a minor key, the composer will specify as such, but if it just says “___ in D”, assume it means major. Now, what is a canon? The simple answer is it’s an imitation-based song. So in Canon in D, the three violins are all playing imitation parts. The first violin part is the trendsetter, and then the second violin part plays the exact same thing but a couple bars delayed, and then the third violin copies the first violin, but at a delay of 4 bars. This creates a really neat overlapping effect. So throughout this piece, the first violin is always playing the leader role, and the other two violins are copying those notes 2 and 4 bars delayed, respectively. We’ll take a listen to examples of that in the song in a minute. We won’t spend too long discussing Pachelbel himself – that’s the subject of a whole other video – but he was very well-known and well-respected in his day. He was actually good friend with Johann Sebastian Bach’s dad (The JS Bach we know and love was popular in the late Baroque period, and Pachelbel was a generation older). Pachelbel taught Bach’s older brother (Johann Christian Bach). So the origin story of Canon in D is unknown. We don’t know why Pachelbel wrote it, or for what. But one good guess is that Pachelbel wrote it for Johann Christian Bach’s wedding in 1694, since he was known to have written some music for the event (as well as other musician friends and family). Unfortunately, as is bound to happen with the passage of time, Baroque music became unfashionable in the Classical era, but later on, in the Romantic era (19th Century), Baroque music re-surged in popularity. But it wasn’t until the 1960s-1980s when Canon in D really exploded in pop culture popularity. Jean-Francois Paillard published a recording of it in 1968, which triggered many imitators, until it became one of the most well-known Classical songs by the 80s. So now it’s analysis time! The first thing I want to talk about is a ground bass. This is a term used for patterns in music, and Canon in D has one of the most famous patterns. If you’re a piano player, you’ll generally play this pattern in the left hand. Otherwise, this part is usually played by a bass-type section, or in the Baroque period, a basso continuo. It starts on the tonic, and then alternates moving down a 4th/up a 2nd until the last two notes, which lead to the dominant. So remember, the tonic is the main key of a song. If a song is in the key of D, the tonic is a D. At the end of the pattern we move to the dominant, which is the 5th note in a key. In this case, it’s A. The dominant leaves a sound of suspense, a sound of “more music to come”, and leads perfectly back into the tonic, where it can loop forever and ever. And actually, that’s basically how this song works. This “ground bass”, or musical pattern, repeats over and over until the end, while the higher parts go through different variations. So let’s take a listen to this extremely recognizable pattern that starts right at the introduction. Okay so a couple minutes ago, we talked about what a Canon is. Now let’s actually take a listen to how it’s applied. So after our ground bass intro, you get the first violin entering the picture, starting the tune. A couple bars later, the second violin repeats. Then, the third violin repeats. It’s basically like a game of follow the leader, where the first violin is the leader. Let’s take a listen to the sound of the canon – try to see if you can notice the first violin’s part get imitated every two bars. Let’s take a look at another example from the middle of the song, when we start getting into all of those awesome fast notes. 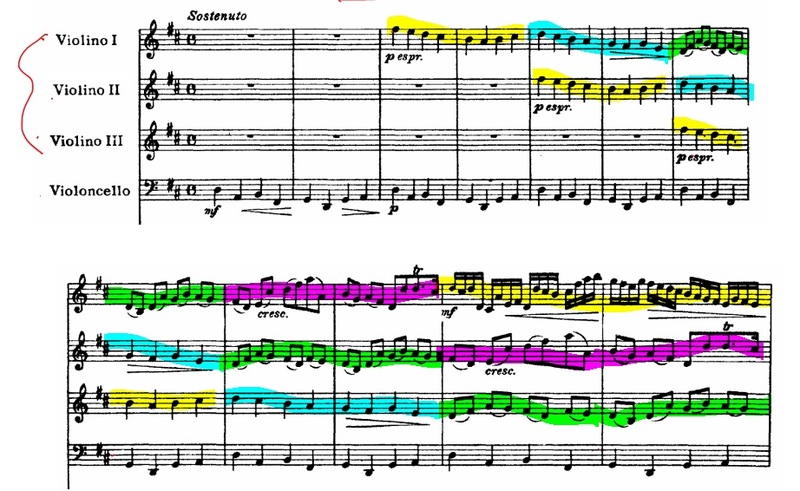 So with the yellow highlighter, I’ve marked the first part, the entrance of the tune, played by the first violin. 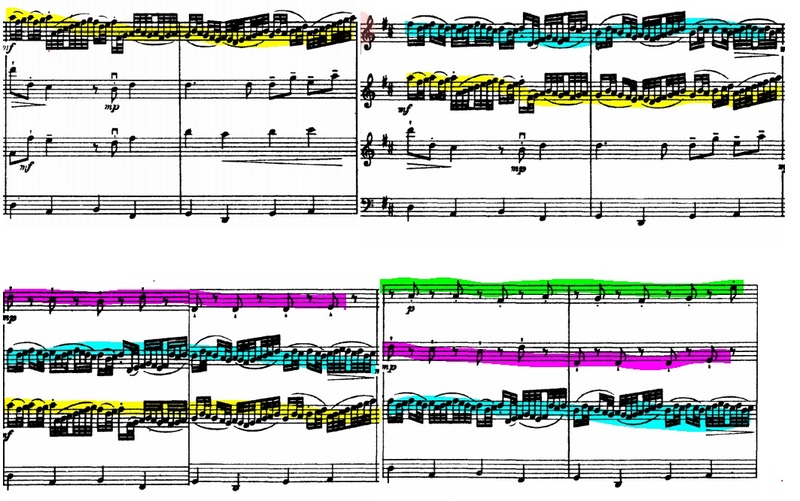 In two-bar increments, you can see the “yellow” part imitated first by the second violin, then the third, like a chain reaction. And this happens every time the first violin plays a part. You can see the blue highlighter marks a new part, which is echoed again, and then a new part in purple, and so on, for the duration of the song. I’ll leave this up on the screen while we take a listen – see if you’re able to hear the echo and imitation used. Now it’s worth noting that though this song is definitely a Canon (well, when it’s played with multiple instruments – the canon element gets lost in the piano solo), it also has elements of a song form called a Chaconne. This was kind of like a Baroque version of 12 bar blues – it just means you have this repetitive ground bass (or chord pattern) that the melody instruments jam over and create variations on. So Pachelbel blended these two styles – Canon and Chaconne – into one piece. Well done! Since Canon in D has resurged in pop music over the last few decades, I thought it would be neat to look at some of the pop songs that use the same ground bass as Canon in D.
In the alternative music world, Green Day uses it for “Basket Case”, and Oasis uses it for “Don’t Look Back in Anger”. In pop, you have The Farm’s “All Together Now”, which is the exact same progression as Canon in D with no variations. There have been endless covers and variations of Canon in D itself, like George Winston’s piano version, and Trans-Siberian Orchestra’s instrumental version. I actually think Canon in D has a lot in common with pop music. It’s simple, clear and easily recognizable. It doesn’t necessarily embody fantastic, forward-thinking song-writing, though the writing is clever. It’s definitely catchy. Compared to the previous analysis video of Debussy’s Clair de Lune, this song is pretty much the opposite. Clair de Lune is all about subtlety and obscurity, whereas Canon in D is obvious and direct. Both are good in their own respects. But of the two, you’re far more likely to be caught humming Canon in D. This doesn’t make it better or worse – it just makes it more accessible. It’s a great gateway into Classical music for people who are new to Classical music, or who have no apparent interest in it. And because of the simplicity of this piece, analysis is very simple as well. It’s not immensely complicated to understand. If you’re interested in learning how to play a simplified version of Canon in D, you can check out the tutorial I did on that piece recently. Hopefully you learned something new in this analysis of Canon in D, and I’ll catch you guys next time! Advanced Piano Solo. Composed by Johann Pachelbel (1653-1706). Edited by transcr. Robert Schultz. Arranged by Robert Schultz. Masterworks; Piano Solo; Solo. Baroque. Single piece. 10 pages. Published by Alfred Music (AP.0155CP1X).